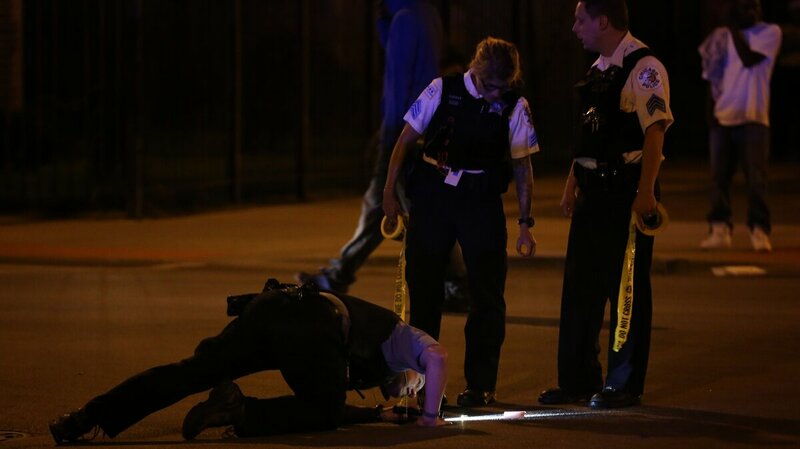 More Than 50 People Were Shot In Chicago Over The Holiday Weekend : The Two-Way The Chicago Tribune called it "the greatest burst of gun violence Chicago has seen this year." The number of shootings in the city has risen since last year even as the homicide rate has fallen. Police investigate the scene of a shooting at 75th Street and Stewart Avenue on Saturday in Chicago. At least 50 people were shot in the city, nine of them fatally, in a wave of violence over the Fourth of July weekend. At least 50 people were shot in Chicago, 12 of them fatally, in a wave of violence over the long Fourth of July holiday weekend. The Chicago Tribune called it "the greatest burst of gun violence Chicago has seen this year." The numbers came from The Associated Press. The Tribune had higher numbers and included shootings from late Thursday. The newspaper said that from Thursday night into Friday, three people were killed and 10 wounded; from Friday afternoon into Saturday, 20 people were shot, one fatally; from Saturday night into Sunday morning, four people were killed and 10 wounded; and from 2:30 p.m. Sunday to 3:30 a.m. Monday, four people were killed and at least 26 more wounded. Nearly all, the Chicago Sun-Times notes, were black or Hispanic men age 35 or younger. Police shot five people, two of whom were killed. The two dead were teenagers, 14 and 16. Police said both teens, who were shot in separate incidents 24 hours apart, were armed. NPR's Cheryl Corley, reporting on All Things Considered, quoted Chicago police Supt. Garry McCarthy as saying his department had a plan prior to the holiday weekend that included putting hundreds more officers on the city's streets. "And what were the results? A lot of shootings and a lot of murders, unfortunately," McCarthy said at a news conference. He blamed the proliferation of illegal guns in the city for the violence. "There's too many guns coming in and too little punishment going out," he said. The Sun-Times reports that while homicides are at their lowest levels since the 1960s, shootings have increased since last year. Indeed, as our former blogger Mark Memmott noted in April, a weekend of violence in that month left 45 people shot. A month later, NPR's David Schaper witnessed a shooting on Chicago's South Side while he was interviewing a real estate professional for a story on her community's effort to mobilize for positive change.